Hobbits, Dwarfs, Elves, Adventures, and just plain hobbit talk and fun. I feel like I have not posted in a millennium! I apologize very deeply for that! It has been very busy, and I have some very special news for you. 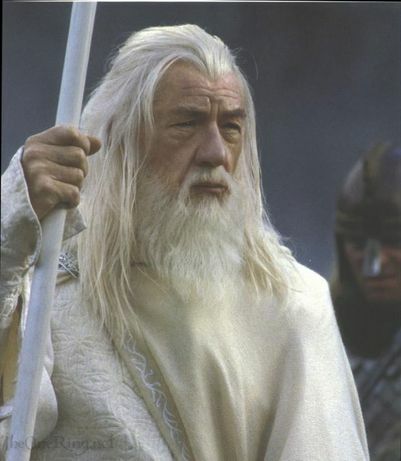 We just received an email from Gandalf. It seems he wanted to catch up with us in technology so he ordered one. 🙂 It took a long time to get to him though. Anyway, it seems that all is well in the land of the Elves. Frodo is doing exceptionally well, and Bilbo is having the time of his life writing stories and hanging out with Galadriel. Merry and Pippin are getting in to Farmer Magots crop again. Last week they took ten tomatoes, three heads of lettuce, four mushrooms, and a tankard of ale. They are getting greedy. Gimli and Legolas stopped by last week to see how we were doing, and Gimli and I had a drinking contest (please don’t tell my Mum) and he won, he was the last one standing before he passed out. I think I had about eight pints of that stuff. Everything is very peaceful in Hobbiton right now, nothing out of the ordinary. We have been getting regular reports from King Aragorn and General Faramir about orks that keep popping up, and new birth places of Uruk-Hai, which the orks found. So they are definitely keeping busy. I must admit to you all that I am getting a bit restless, I want another adventure. I must be related to Bilbo. Suddenly there was a really loud noise, not I don’t know if you now what a trumpet sounds like (You know…like the war trumpets) but this one was at least three times louder than a normal one. We all (including the Urak-hai) look around, then Faramir and his men (bless them all) jump in and start fighting, and is only a matter of minutes before the Urak-hai run off or either are…you know. I just wanted to go over and kiss Faramir’s feet, Pip would have if Merry hadn’t stopped him. We all bowed instead and there was a lot of thanking, not to mention hand clasping and hugging. Faramir: One of my scouts told me you were about to be ambushed. Legolas: We are forever in his and yours debt. Faramir: You can repay us by coming back with us to Gondor, Aragorn would be most pleased to see you agin. Legolas and Saraleen together: That sounds most welcome. Gimli: It most certainly does, he has better Ale then the dwarves do. Pippin: …I like both those things. Here are some new pictures by Pip. The first one, Gandalf didn’t know Pip was taking the picture or he would have been looking at the Magic Box thingy instead. 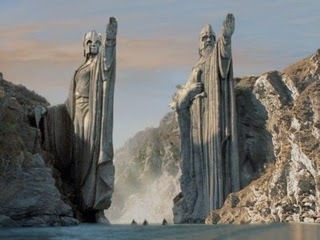 The second one is rather neat don’t you think, I am pretty sure Aragorn took that one though. I am very sorry for not posting sooner but so many things have happened since I left…so let me see…were in Middle Earth do I start…Oh Shiver me toadstools I can’t think proper at all. You see while I was gone…I was captured by orks, and they gave me this nasty…well I am getting ahead of myself. The day I left was they day…you know….the orks got nasty. We knew some had been following us, but we never stopped to think that they might follow us into the Marshes (which is where we are now. 🙂 Well I was being ever so stupid and decided to lag behind a bit because I was pooped. So WHOOSH I was nabbed from behind and gagged. Since orks are just a bit bigger then me they lifted my like a feather and threw me over the shoulders—which wouldn’t have been so bad,but they wore this spiky armor that pinched—I couldn’t do anything at all and I just hopped that my friends would notice an important part of the group was missing *haughty sniff that turns into a sneeze* the orks continued to follow them, me kicking all the way, and Pip was actually the one to discover my disappearance, at first they all thought I was down with the old *shudders* but no, I am up with the young that looks like the old. But Legolas knew he would have heard a splash and he didn’t. So that is when he turned around and pierced the darkness with his ever so keen elvish eyes and saw us. The orks were quickly…um…disposed of. 🙂 And me being the silly hobbit I am, drank some of their stuff thinking it was water, that is until I swallowed a gulp, I was instantly wishing I was dead for a moment. Saraleen gave me something and that helped. Merry said he never had anything to help him get over it after he drank some. 🙂 And some other things happened but I think I should save them for my next post…just to keep you on end *pretend evil laugh* :). I finally made it, half way to a hundred posts. I know it isn’t a lot but for a small hobbit it seems like a WHOLE lot. You probably don’t really want to know were we are right now, in a forest, nearing the Marshes, and it is dank, dark, smelly, dirty, rooty, and is a very tight squeeze, even Legolas, who is the thinnest of our group this moment, has trouble getting in and out of the dirty great roots. We hobbits don’t have such a hard time, we crawl, but you can just imagine how we look. Pippins arm is doing better, he can crawl well enough, he just has to go behind us. 🙂 Gimli is struggling, and Mr. Bill went of somewhere, I hope he is alright, I certainly believe he is trying to find his way around, we have his food. 😉 Oh and since I am on the subject, have any of you been in a forest, crawling and typing at the same time? If you have, you have some awesome muscles, I don’t this is killing me. I don’t think I will be able to use my hands, arms, and back for days…*loud thonk*….OW…sorry, bumped my head on a dirty great root. I can’t wait to wash off, oh wait…we can’t wash of in the Marshes, or we go down to be with the humans and elves ancestors, you know…how could something so majestic as an elf, end up looking like that when he is dead…Just one of those things I don’t like to muddle over but I do anyway. 🙂 I better go now before my fingers fall off. These are my Pals, Merry and Pippin. 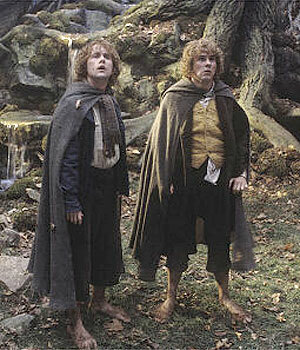 They get me into to a lot of trouble, (not to mention themselves) and are the funnest hobbits in Hobbitton. You will usualy find them, stealing Famer Magots crop (me with them sometimes) or smoking. They love fireworks, and tried to make one, but they had to rebuild Merry"s house after that. This is Legolas, our singer, corny line puller, and friend. I don't think we would be alive today with out him. He is tall and can walk on snow (lucky) and is very good with his bow and arrow. He is also married to Saraleen. 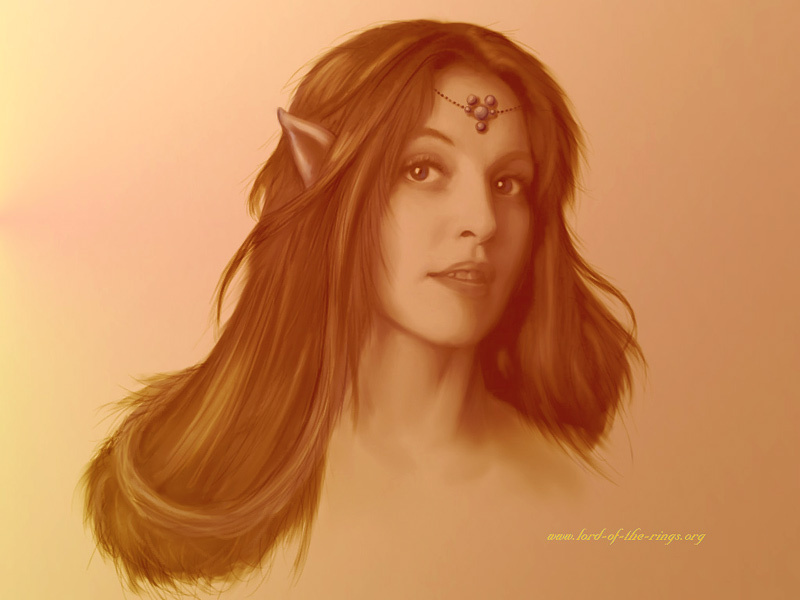 This is Saraleen, an Elf that we met in The Golden Wood. She is fun, loving, caring, spunky and very pretty! And she is married to Legolas. This is Gimli, our drinker, smoker, dry sense of humor dwarf. We all love him, but we don't show it or he would get ticked off as you humans would say. All you need to do is put your email address in here, and you will get updated when I do new posts.